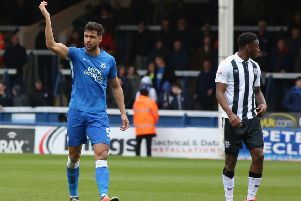 Matt Godden celebrates the second goal for Posh against Gillingham. Photo: Joe Dent/theposh.com. Peterborough United star Marcus Maddison claimed his 50th goal for the club as they kept alive their League One play-off hopes with a 2-0 win over Gillingham at the ABAX Stadium (April 6). Maddison, who converted a 58th minute penalty, also set up a late second goal for substitute Matt Godden as Posh claimed back-to-back League One wins for the first time since the end of October. Doncaster’s win at bottom club Bradford City leaves Posh five points outside the play-off zone, but with a game in hand. With Posh needing a win to stay in touch with the top six and Gillingham probably needing one more win to be safe there was plenty to play for, not that you’d have known from the first 45 minutes. Posh fielded a front four with excting potential, but they lacked the wit to get the ball to the feet of chief playmaker Lee Tomlin and Ivan Toney’s struggle for form right up top continued as poor control and fouls often stopped his side’s momentum in its tracks. As a result Posh threatened only occasionally. Toney did take down a Jason Naismith pass with great skill, but Gills’ keeper Tomas Holy was out quickly to save. Holy had little else to do bar collect a scuffed Dembele effort, although Luke O’Neill’s trip after Toney had been played in by Dembele saw off potential danger. O’Neill was shown a yellow card before Maddison struck his free kick into the wall. Gills were little better, but did come closest to scoring five minutes before the break when a Tom Eaves header was well saved by Posh ‘keeper Aaron Chapman. Toney had been bundled to the floor at the start of that move which was about the only occasion Championship referee Robert Jones didn’t award a free kick for contact. He was aided in his attempts to ensure a stop-start game by the fussy assistant in front of the main stand. 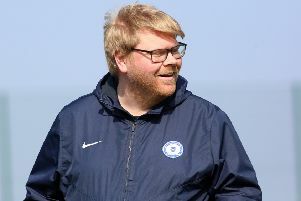 Posh did start the second-half better after switching Maddison to the right wing. He twice drilled shots across goal before he fired Posh in front from the penalty spot. Dembele won the spot-kick after accepting Toney’s pass and bursting into the area. He spurned the opportunity to shoot with his left-foot and was then slightly fortunate Dean Parrett tugged his shirt. Maddison sent Holy the wrong way from the spot for his fifth goal in his last six matches. Gillingham rallied well and the disappointing Eaves and Brandon Hanlon sent headers over the crossbar and Regan Charles-Cook sped a shot just wide from 20 yards. But Posh sealed the points four minutes from time when Godden won a header high up the pitch. The ball fell to Maddison who returned the ball to Godden who finished well. Posh defended well throughout to claim a second successive clean sheet with centre-backs Rhys Bennett and Ryan Tafazolli outstanding.